Heading out the door, you check the temperature. Already 80 degrees! Sweat begins pouring down your face. Just minutes into your run, you’re already out of breath. The scorching sun feels like your enemy, staring you down. The humidity is unbearable–sapping all the energy out of every fiber of your weary muscles. Your parched mouth craves water sooner than normal. Tempted to quit, you wonder if you can finish what you’d planned to run. You’d give anything to return to the previous months of cooler temps. But no, this is what it’s like to run in the heat of summer. 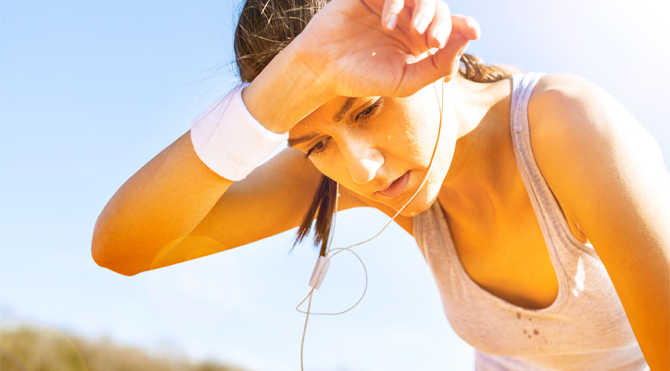 Running in extreme heat puts more stress on the heart and our muscles don’t get as much oxygen. The higher the humidity level, the harder it is for our bodies to evaporate sweat, making it difficult to cool down. No wonder we reach exhaustion sooner! But runners who want to maintain fitness goals and train for fall races have no choice but to run in the heat. So instead of quitting, we must adapt to the heat. There are multiple tips on beating the heat, but the most essential thing we can do is maintain optimal hydration. We have to drink more than what we’re used to–even when we don’t feel thirsty. Without enough water we risk dehydration, causing muscle cramps, dizziness and nausea. It’s a matter of survival! Just as runners must hydrate more frequently in extreme heat, Christ followers must run to the source of our living water–especially when we’re in a season of life that feels like a desert. Ever been there? Before the day even starts, a wave of exhaustion washes over you. You dread the day ahead. Can’t I just pull the covers over my head and go back to sleep? You’ve lost your joy. Your motivation to live purposefully has disappeared. Your faith feels like it’s dried up, leaving your soul parched. Maybe you don’t feel God near you. Perhaps you’ve given up waiting for an answer to your prayer. Every fiber of your weary soul is burdened. Worn out from stress and anxiety, you wonder if you’ll ever make it to the other side of the desert you’re trudging through. Why even bother? Does it really matter? Dear friend, it does matter! Although Jesus told us to expect trials in this fallen world, he promised to never leave us–even when we don’t feel it. Desert seasons often usher in waves of exhaustion, fear and hopelessness–crashing in and pushing out our peace and joy. But instead of quitting, we must resolve to stay faithful and embrace Jesus with our whole heart. Whether we thirst for him or not, we must fix our eyes on him and cling to him more than ever before. Spending time in prayer. Soaking up promises from his word. Resting in his presence. Reaching out to him desperately. Without him, we risk falling into hopelessness and despair. It’s a matter of survival! I don’t know how long your desert season may last. But I can promise you that Jesus is with you every step of the way. Your sun-scorched soul will be watered…by him alone. The heavy burdens weighing you down will be lifted…by him alone. The empty places of your heart will be filled…by him alone. READY? If you’re walking through a desert season, what are you actively doing to maintain your relationship with Jesus? Recall a previous time in your life when you walked through a desert season. What insight did you gain from that time in your life? Claim a promise from God’s word you can cling to for times you may not feel his presence. GO! Jesus, I praise your name for your faithfulness to me. Even when I’m going through a rough time, I thank you for your promises. Help me embrace your presence when I’m walking through a desert. May your truth fill my thirst and satisfy my longings. You truly are the living water. Amen. Thank you for stopping by my blog and for your kind words! I’ve enjoyed my visit here…especially this post, Living in the south, I totally understand heat and humidity. I LOVED the parallel to our spiritual lives! Thanks for sharing!! Thanks for stopping by my blog! I love all the parallels there are between running and our Christian faith journey. Blessings to you. Blessings and peace to you too!